Home > Dining and Gourmet > Fast Food > KFC: Flash Post to Enjoy 2 Tori Katsu Burgers at Only $7 (UP $11.80)! 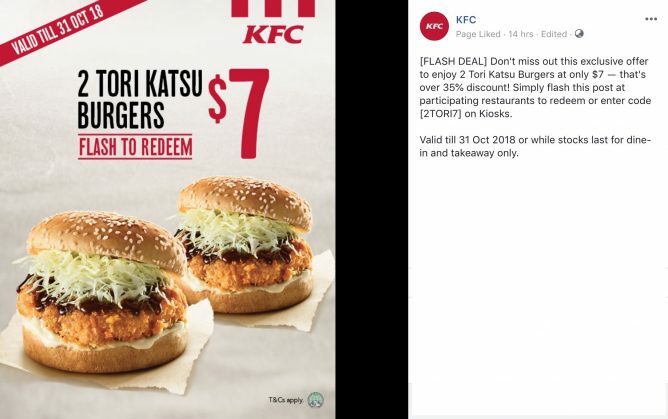 Till 31 Oct 2018 KFC: Flash Post to Enjoy 2 Tori Katsu Burgers at Only $7 (UP $11.80)! 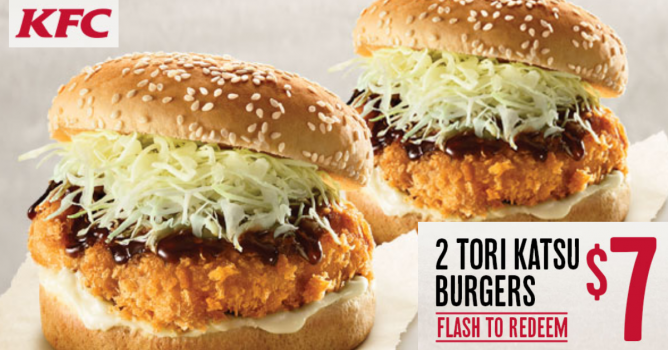 [FLASH DEAL] Don't miss out this exclusive KFC offer to enjoy 2 Tori Katsu Burgers at only $7 ― that's over 35% discount! Simply flash this post at participating restaurants to redeem or enter code [2TORI7] on Kiosks. Valid till 31 Oct 2018 or while stocks last for dine-in and takeaway only. Promotion: Flash Post to Enjoy 2 Tori Katsu Burgers at Only $7 (UP $11.80)! While stocks last for dine-in and takeaway only. Flash post to redeem. Previous: Sasa: End October with 20% OFF Storewide at All Sasa Stores!